Special keynote instructor for March 11, 2018 -Dr. Dewey Caron! Caron will also be in that weekend to lecture at our Kansas Honey Producers Association meeting to be held in McPherson, Kansas on March 9th and 10th. It’s NEKBA’s annual Beginning Beekeeping Class for 2018. See our NEKBA 2018 Bee Class form, which covers both Sunday’s, March 4th & 11th from 12-5:30 PM. LOCATION – Douglas County Fairgrounds – 2110 Harper Street, Lawrence, KS. Drive KS K-10 to Harper Street, go north 2 blocks to the Fairgrounds. Visit the NEKBA.org website for more information and links. Classes are on Sunday’s, March 4 & 11, 2018 (parts I and II). The 2nd day of the workshop is being taught with a special presentation on bee biology, mites, an over-view of hobby beekeeping, and how to’s of starting your own hive. This event offers the opportunity to hear and learn from a distinguished expert in the field of modern scientific beekeeping, Dr. Dewey Caron. What might it take to get started? Check out this suggested equipment list with pricing from 2017. The registration fee includes Dewey’s text book. All registrants will be eligible to win door prizes. You must be present to win. 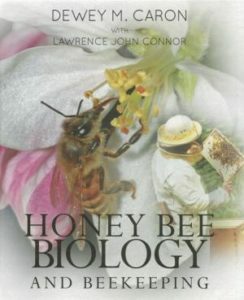 Each family registration will receive 1) Honey Bee Biology and Beekeeping, Revised Edition Authors or Editors: Dewey M. Caron with Lawrence John Connor and registration notes. Each registered person will receive a set of presentation notes. If you already have these books, there will be an alternate choice available at the door. Caron began working with commercial beekeepers as soon as he arrived at Cornell in 1966. Caron also had the opportunity to teach the popular beekeeping class, which Morse had designed from an English course. He met his wife, Nieves, at The Kellogg’s International Fellows Training Workshop, where she was a fellow from Bolivia and he from Delaware. They now spend part of each year in South America and part near Portland, Oregon, where he has retired with a couple of beehives near the families of his sons. Caron was well loved as a teacher during his 27 years at the University of Delaware. He taught entomology, ecology and apiculture, carrying a full course load every semester while crisscrossing the state as advisor to the Delaware Beekepers’ Association and giving classes in his extension role. When he retired in 1988, he received the University’s Excellence in Teaching award as well as recognition by the Entomological Society of America for his prowess as an educator. Teaching outlines and syllabi from scores of classes became his classic book, Honey Bee Biology and Beekeeping (Wicwak Press). He says, “Beekeeping is applied bee biology.” The book explains aspects of bee biology that determine when and how to manage a colony, a concept inspired by the teaching of Roger Morse at Cornell. The thorough book, first written in 1999, is now in its sixth printing. A new edition will no doubt include information learned since then from DNA: that the bee originated in Africa, not Asia, and Caucasian bees, which were once “readily available” have mostly submerged into the gene pool. These are small points in what is a valuable compendium of valuable information. Caron has written five beekeeping books, numerous book chapters, over seventy scientific publications and over 300 popular articles on bees and insects. 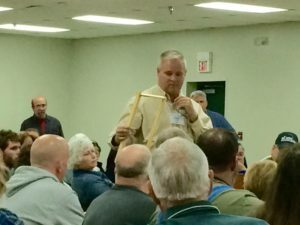 He has been the editor of newsletters for the Delaware Beekeepers Association and the regional organization MAAREC as well as BeeCraft America. Hope to see you at the NEKBA Bee Class 2018 ! This entry was posted in Bee Clubs, Beekeeping, NEKBA, Uncategorized and tagged Bee Class, Beekeeping Class by Robert. Bookmark the permalink.